Robert Shiller has a post at the New York Times' Upshot, headlined "The Housing Market Still Isn’t Rational". (HT: Mark Thoma). Robert Shiller seems like a level-headed, intelligent, deeply informed expert. But, it seems to me that his behavioral explanation is leading down a path of sloppy just-so stories. If you accept the efficient markets theory — and believe that real estate is an efficient market — then these (KE: rising home) prices are based on “new information,” even if you don’t know what that information is. The housing market ...is far less rational than even the often irrational stock market, for a couple of important reasons. First, most investors find it difficult to understand how housing supply responds to changes in demand...Developers and builders will, one way or another, exploit overpricing, increasing effective supply, in that way bringing real estate prices down. This sounds reasonable, but there are several problems here. First, there isn't a supply response, which is the problem. Here is a comparison of permits issued in San Francisco (annual units/thousand people) and the national rate of permits issued. The major metro areas have, are, and will continue to have constraints on housing supply. The next graph, which I linked to a few days ago shows rent levels relative to incomes in several major cities. How can someone in 2015 invoke a supply response as a reason for the housing bust? As unfalsifiable as efficiency can be, what is less falsifiable than claiming that people are irrational? I fear that this predisposition causes behavioralists to settle on behavioral explanations too easily. Here it looks like there are some pretty obvious red flags that Shiller has not bothered to think about. Do you see the irony here? Shiller complains that there are gullible home buyers who bid up prices to unsustainable levels and implies that people who defend those prices are gullible believers in efficient markets. But, do you see why he says the home buyers are wrong? Because Shiller, himself, is assuming that housing supply is efficient! It's Shiller who gullibly believes in efficient markets for housing supply. Yet, the evidence points to obvious inefficiencies in supply! It was perfectly rational for those 2000's real estate investors to presume that rent inflation would persist. As of 2015, when Shiller is writing this article, the real estate investors have clearly been proven right. Take a look at the rent graph. In Shiller's version of events, the bust would have come from overbuilding and a collapse in rent. Rent has done the opposite - it has skyrocketed. Robert Shiller, the efficient market dogmatist, promises supply will pull those rents back down. Never mind that housing starts have been at record lows for a decade along and rent skyrocketing for 15 years. Eugene Fama would blush at the stridency of his unlikely disciple. But, the further irony is that the thrust of his argument is to undercut supply. Do you think someone reading his article as a guide about whether to buy a new home from a homebuilder is going to be more likely or less likely to fund more housing supply? Do you think the FOMC takes in the consensus view of important economists like Dr. Shiller and loosens the reins on mortgage credit that could fund more supply or tightens them? How big of a difference would it make if, instead of scaring everyone away from funding supply, Dr. Shiller took his message to New York, Los Angeles, San Francisco, etc., and said, "Hey, folks! My theory only holds if you actually let developers build at market rates until rents come down!"? His second point is structural, which is that short selling isn't possible in housing. I take some issue with this point also, although it is more arguable than the first point. Shorting is common. Think of the bond market. The way you short a bond is to issue a bond and pay the coupon payments on it. Every household that lives in a house is naturally short on housing. We all pay rent (or imputed rent). In fact, as I pointed out in a recent post, homeownership peaked in 2004, and even while first time homebuyers appear to have spiked in 2006 and 2007, homeownership declined. Much as equity markets engaged in regime shifts can see spikes in margin investing and shorting, we saw this in housing. The way we facilitate real estate ownership is like trading equities on a highly leveraged margin - a more bullish long position than anyone would take on equities. The tactical shift of unwinding that position back to renting is just as strong in the direction of going short, and in a way is just as leveraged in the short direction. Since we don't disaggregate our real estate transactions, these tactical shifts are huge, so only a few households selling their homes can have the same effect as hundreds of investors taking marginal tactical short positions on their stock portfolios. There is a limit to this. Institutions can't easily take large short positions, but the average household has a natural short position of a couple hundred thousand dollars. Many households in places like California can short hundreds of thousands and even millions of dollars worth of real estate fairly easily - actually more easily than they could short equities. So homeowners are neutral, renters are short, and landlords are long. What we have actually seen in the 2006 to 2015 period is that households are being forced into short positions by a hamstrung banking system, and there are too many organizational and regulatory barriers to institutions taking long positions to counteract that. This is common, not just among behavioralists, but also Austrian business cycle folks, and traders. But, the whole "smart money" idea always rubs me the wrong way. It's presumptuous. And, for instance, here, where Shiller mentions how smart money is responsible for the big jump in building permits, he has missed the apparent cause of the jump, which is a regulatory deadline in New York City that is not likely to lead to persistent strength. The behavioral criticism of efficient markets is basically claiming to prove a negative - that among the vast sea of actors in a market too few of them possessed the wherewithal to push prices to their efficient levels. That's a pretty presumptuous position to take, and it doesn't engender confidence to make claims about what "smart money" is doing that have basic factual errors. There is no smart money in an efficient market. First, I'm calling shenanigans on the "the average person expected 'x', but half the respondents expected even more, and some much more!" routine. Shiller seems to always shade these things to push the "irrational exuberance" angle, which, again, if you're going to be the appointed guardian against cognitive biases of investors, just doesn't play well. Second, there may be no smarter play in the American economy than betting that San Francisco will not have a supply response to housing demand within the next 10 years. You want to see irrational markets, go sit in on a San Francisco developer's public hearing. I'm a broken record here, but that seems like a pretty big thing to not notice if you're claiming to have insights about how people can screw up market efficiency by being irrational. But, you know what, the housing market is so efficient that, even though the San Francisco area has shorted itself by hundreds of thousands, if not millions, of housing units, exurbs like Pleasanton and Dublin, and even Las Vegas and Phoenix found a way to entice households into adjusting their real estate portfolios into other places. So all those condos we didn't build in San Francisco were replaced by McMansions in Mesa, AZ and Henderson, NV. And a lot of people, including Robert Shiller, were beside themselves about it, so we killed it. We suffocated it by pulling empty money bags over its head. There can't be any smart money where there ain't no money. And the guy who sees inefficiencies everywhere but where they are congratulated us for it, and we congratulated him back. "See! We knew it! ", everyone tells each other. We're in this mess because of them, the people growl. I think these behavioralist interpretations are technically wrong. But, in the end the damage is behavioral, creating unnecessary and damaging public demands against the very thing we need - supply and access to ownership. The behavioralist misinterpretations create irrationality where it can really dig in and create persistent inefficiency - public policy. Maybe the next movie about the housing bust should be by Charlie Kaufman. How much credence does Shiller's presence give to the false notion that our biggest concern is high asset values? What if that is wrong? What if asset prices aren't too high? What kind of damage is being done by machinations to bring them down? I mean, if asset prices don't reflect a 20 year run of irrational demand, then think of what we have to do to beat them down? We have to beat ourselves down. There is a huge cost here to being wrong. Here is a graph comparing net rental income on owner-occupied homes to real rates on long term treasuries. This graph looks to me like it shows a housing market that was arbitraged pretty efficiently with real bond rates until 2007. (All the lines but the blue housing line are proxies for 30 year real treasury rates - accuracy, in order from most to least is: green, red, purple.) Remember high rates mean low prices. And Shiller is posting articles in the New York Times about how the housing market is inefficient...because prices are rising too high?! Arbitrage profits have only been available in housing since 2007 - by buying them. Those profits are available because of the limits to going long on housing - because so many owner-occupiers can't get mortgages and because institutional buyers are building organizationally from such a small base. PS. There is an adjustment I wanted to look at on the long term Home Price Index Shiller keeps. I feel like I'm being irrationally exuberant myself by taking issue with some of these things. After taking him to task, it would serve me right if a reader finds that I made some basic algebraic error or something. And, Dr. Shiller is very generous about making data public, which I have gotten much value from myself. But, I have noticed that the long term real home price index that people use to demonstrate how irrational the 2000s housing market was is adjusted using CPI for all items. It seems more appropriate to me to use Shelter inflation, which we have going back to 1953. If rents are inflating at a different rate than other items - and why wouldn't they - then wouldn't rent inflation be the right metric to deflate home prices by? And, there has been an ongoing problem, which I think has generally been a late 20th century problem (and after) of creating artificial housing scarcity in our large cities. This creates ever higher rents in these areas, which leads to persistent rent inflation, the rate of which is determined by the substitutability of real estate outside those areas for the prime real estate. So, we might expect real estate in Oklahoma to inflate at more or less normal levels, but there will be some level of rent inflation in the cities that will accumulate over time. And talk about inefficient markets. Places like New York and metropolitan California have policies explicitly set up for inefficiency. People in those cities work, with passion and moral fervor, to make sure that money cannot purchase real estate in their cities. Money is the thing they don't want you to offer them for their real estate. So, here is the chart from the file Dr. Shiller makes public. I have added Shelter inflation from 1953 onward, and added a line to the chart of Real Home Prices, adjusted for shelter inflation instead of broader inflation. It looks a lot less compelling, doesn't it? It's rent that's killing us, not irrational home prices. The difference between that blue line and orange line is a decent estimate of the real wealth that has been sucked out of productive hands by overzealous zoning and building restrictions - transferred to current and past real estate holders. It could be that about 1/3 of the value of our housing stock has come from artificial barriers to building. This represents income we transfer to landowners for the purpose of not housing us. The way we fix it is by building in the major metro areas. Yes, that will be a windfall for some landowners. But, the choice is between windfalls for providing value or windfalls for not providing value. PPS. Shiller referenced an Ed Glaeser paper in his article. Glaeser has some really great papers that I need to catch up on. The paper Shiller references is about historical episodes of housing booms and busts. But, if I read Glaeser right, he says that most of those cases, in hindsight, are much like my reading of the recent boom. The boom valuations were justifiable in looking at subsequent rents or profits and the busts were a product of the optionality of leveraged real estate, where banks get left holding the bag. So the problem is mostly the busts, not the booms, and the busts are related to the design of our financial institutions which leaves real estate markets dysfunctional when there are sharp downturns. Another great Glaeser paper, and another. Glaeser has made many of the points I have been making here recently. An example of the differences between he and Shiller: Shiller ends his New York Times piece with, "The bottom line is that there is no reason to assume that the real estate market is even close to efficient." In that last link, Glaeser and his co-authors begin their conclusion, ﻿﻿"Home building is an enormously competitive industry with virtually no natural barriers to entry." I don't think you're boxing above your weight here. Shiller started giving a speech about the stock market bubble in 1995. The fact that he didn't fill out the concept and finally publish that book until 2000 makes him seem like a genius. And I'm sure he is a genius, or at least very smart. But his predictions really don't show it. His 10 year CAPE has given a sell signal for the last 2 decades or more except for 1 year - 2009. How can that be useful? Perhaps it can be said that he predicted the housing crisis for the right proximal reason but the wrong distal reason. One can be right about noting noticing demand outstripping supply while wrongly assuming it's because demand is going up too much rather than because supply is going too much. Or at least he's smart enough to know that predicting a crisis is a great long term investment for an economist, bound to pay off in withing 10 or 20 years. Kevin, when you note that rent skyrocketed rather than collapsing, you are referring to the several years before the housing bust, correct? One could try to argue that causality went in the opposite direction to what you are arguing: that rising housing costs are driving more people sell their homes and rent, which in turn drives up rent. If the people who are selling are primarily selling cheap homes, and enough people are buying second homes (or speculative homes), or buyers are in general buying more expensive homes (or throw in Schiller's idea of people just bidding up and overvaluing houses), then couldn't you in theory simultaneously see rising demand for houses while at the same time seeing an increase in the number of renters, and therefore demand for rental housing? This narrative might be particular appealing after home ownership peaked in 2004 but prices kept going up. (though I don't know whether homeowneship means number of homes owned or number of people or households that own one or more home). Not that I'm prepared to defend this narrative, but just figured I'd engage in a thought experiment. 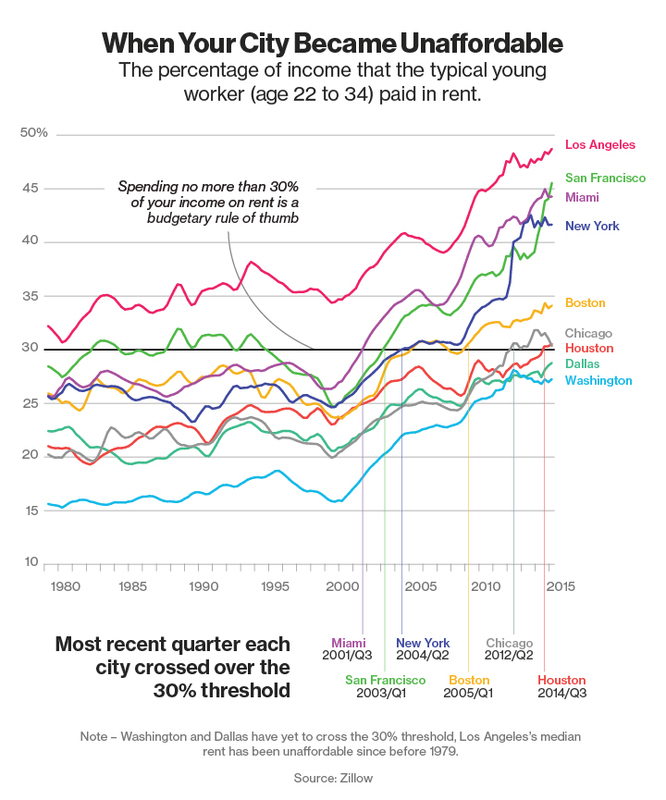 Perhaps in your encyclopedia of graphs you have one showing housing prices lagging rent? Of course, I imagine if speculation or other 'gratuitous' homes are a negligible enough share of the housing stock, and assuming everyone has to live somewhere, then any change in demand for houses or rental property will be followed by an immediate change in the opposite direction by the other one, so perhaps distilling which happens first isn't easy. A little off topic (if you've already written on this in another post, feel free to just refer to it) : what do you think would have happened with the housing market if the fed had never raised the interest rate in 2006? Oops, I only just realized this is a 6 month old article. Rent inflation had only moderated when housing starts were very strong in 2003-2005. It shot up after prices stalled and housing starts and sales started to collapse in 2006. With foreclosures, owner equivalent rent started to fall in 2007 and 2008, but tenant rent remained elevated until 2009. If we hadn't had a series of policies unconsciously aimed at undercutting the housing market and the Fed had raised raised to, maybe 4.25% and held it there in 2005, I think prices would have generally held. They may have corrected a bit in Phoenix, etc. And housing starts would have remained strong. Although, the more I'm looking at the migration issue regarding households moving out of the high cost cities, I'm not sure exactly what would have happened in cities like Phoenix. If economic growth continued to strengthen and economic stress would have led migration to intensify, maybe those secondary markets would have continued to have unusual price pressures. It may be that this situation will eventually lead to a breaking point, regardless of public policy, if economic growth persists and skilled workers keep moving into the Closed Access cities. It does seem clear that states like Texas would have avoided the housing collapse.